It’s that time of year again – the time when every marketer and their dog looks to their crystal ball to light the way ahead. We all want to know what the world is going to be like so we can beat the competition to the punch, right? Noteworthy trend watchers such as JWT Intelligence and trendwatching.com have released their trends for 2012, while local researchers are also chiming in with their own opinions on the state of play. Marketing has done the reading for you and cross tabulated the two to bring you a guide to the consumer trends most likely to shape the Australian marketing world next year. Roy Morgan Research this week released its ‘State of the Nation Report’, which tracks the relative importance of the key issues facing Australians. 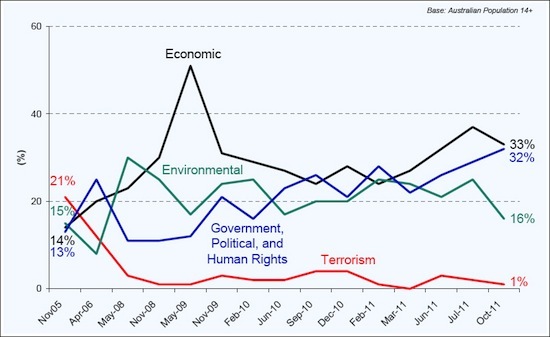 The big mover over the past few months has been ‘government, political and human rights’ which has shot up to almost equal the economy as the most important issue. Concern for the environment has plummeted in recent months as the economy and the country’s governance gained an increasing share of the focus. The economy, of course, has been captivating our attention for quite a while now. According to Dr Rebecca Huntley, director of The Ipsos Mackay Report, the long running social trends study that tracks the ‘mood and mind’ of Australians, we remain in an altered emotional state of conservatism and caution due to a combination of negative political leaders and media, and the filtering down of global unease. JWT Intelligence describes the uneasy and frugal mindset as the ‘new normal’, predicting it will continue for many years. This altered state prompts Huntley to predict that spending will continue to flow towards online and private label goods in response, and that experiences will be favoured over brands even more. However, brands that incorporate experiential elements in their offer, or engage consumers on their journey, stand to unlock spending. Technology is another recurring theme that is impacting on our behaviour and it continues to change the way we work and live. The pervasiveness of constant connectedness is clearly impacting on how Australians spend their leisure time. Fewer are playing sports (23%, down from 32% in 1999) while more are using ‘a computer at home’ (81%, up from 48% in 1999). Time spent facing a screen will continue to grow, with a number of sources predicting a ‘screen culture’ that will see screens turn up in greater numbers and more places. 1. Mobile brings it all together. The impact of the smartphone is becoming all-encompassing. According to TNS, a mobile device is used by 51% of (smartphone owning) Australians while watching TV, 58% to find a product in store, 55% to do live price comparisons in store and 42% after viewing an ad . It is the glue that connects the dots between offline stimulus and online touch point. And it is quickly becoming a platform for closing the purchase cycle also, with mcommerce set to take off rapidly, capitalising on the ability to connect ads, location, deals and purchasing on one device. If you can’t see the above video, please refresh your browser. Video: When grocery chain Tesco wanted to expand their market share in South Korea, they put up billboards in subway stations with their range of products, accompanied by QR codes, that consumers could scan, buy and have delivered by the time they got home. With many prioritising experiences over goods, savvy brands are incorporating experience into their offer. Bricks and mortar retailers are also looking to enhance the customer experience, a necessity if they are to recover, says Huntley. Her research notes an undercurrent of antagonism towards local retailers around disappointing in-store experiences, particularly when compared to overseas. 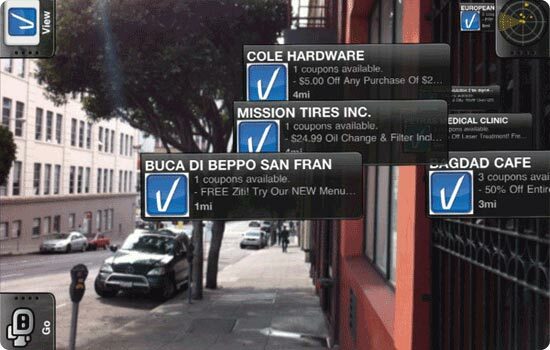 Video: Many are turning to the smartphone to enhance the in-store experience. Macy’s ‘Backstage Pass’ initiative delivered celebrity tips via QR codes on tags to enhance the retail environment. With the explosive proliferation of smartphones, tablets, and the ‘cloud’, 2012 will see more surfaces become screens, and more screens become interactive. This is opening up novel opportunities to inform, engage and motivate consumers. 2012 will see three technological currents converge: Screens will be even more ubiquitous, mobile, cheap and always on; Interactivity via touchscreens, tablets etc. will increase; And, the screen will become an interface to everything and anything that lies beyond via the mobile web and, increasingly and finally mainstream in 2012, ‘the cloud’ . Video: Adidas Germany’s ‘adiVerse Virtual Footwear Wall’ identifies nearby consumers as male or female and provides product recommendations accordingly. In 2012, not only will consumers continue to hunt for deals and discounts, but they will do so with relish, if not pride. Deals are now about more than just saving money: it’s the thrill, the pursuit, the control, and the perceived smartness, and thus a source of status too . However, deals will have to take on new creativity and relevance to consumers, with large discounts losing their novelty and no longer considered out of the norm. Pictured: Notikum is a real-time, location-based app for Singaporeans which enables users to find deals near them, organised into categories of ‘Shop’, ‘Eat’ and ‘Play’. The desire for authenticity goes up a notch every year. It’s now reaching the point where consumers are drawn to brands that behave more humanly, including by exposing their flaws. According to JWT, a greater emphasis will be placed on reintroducing randomness, discovery, inspiration and different points of view into our worlds. Consumers will embrace brands that push the boundaries with frank, risqué or non-corporate products, services and campaigns. 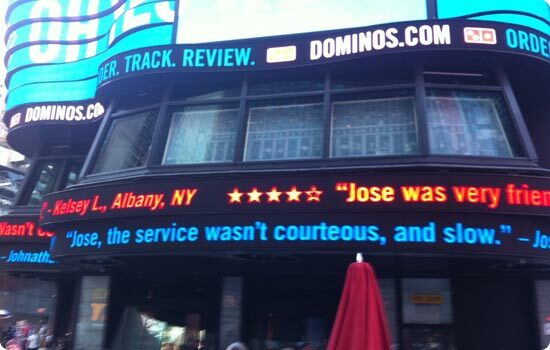 Pictured: In July 2011, US-based fast food retailer Domino’s launched a month-long promotional campaign in New York. Hiring out a huge billboard space in Times Square, the brand live-streamed good and bad customer feedback via Twitter onto the digital hoarding. Prolonged economic unrest in the developed world has created consumers that are permanently in a cost sensitive state. Frugality and thrift are now the norm, with spending unlikely to return to pre-bust levels anytime soon. JWT Intelligence predicts that marketers will find new opportunities in creating stripped down offerings, smaller sizes and otherwise more accessible products and services, such as is common in the developing world. 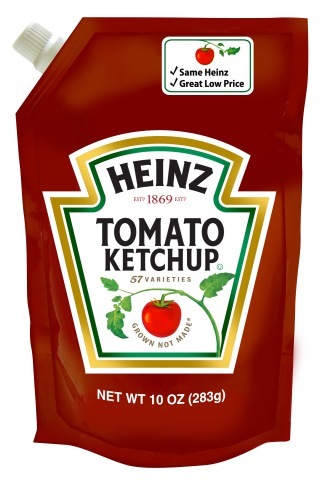 Pictured: In the US, Heinz has introduced a range of smaller-sized and less expensive products to boost sales in a sluggish economy, including a 10 ounce (284 grams) pouch of ketchup retailing for US$0.99. A final thought to keep in mind is that, according to JWT, trends don’t occur in isolation. They tend to intersect and work in tandem with each other. If this is true, these trends suggest that in 2012 your brand needs to start acting more human, revealing its flaws while exciting your customers with randomness delivered with a relevant deal via an interactive touchscreen experience. Marketing magazine looks forward to hearing how you go about this. Findings from Roy Morgan Research, State of the Nation, November 2011. TNS, The Evolving Online Consumer, November 2011. JWT’s 10 Trends for 2012 report is the result of quantitative, qualitative and desk research conducted throughout 2011.